Good Morning, everyone! WOW! It’s already the 13th of July. We want to congratulate all the 4-Hers on their projects from the Fair and also the Open Class winners. 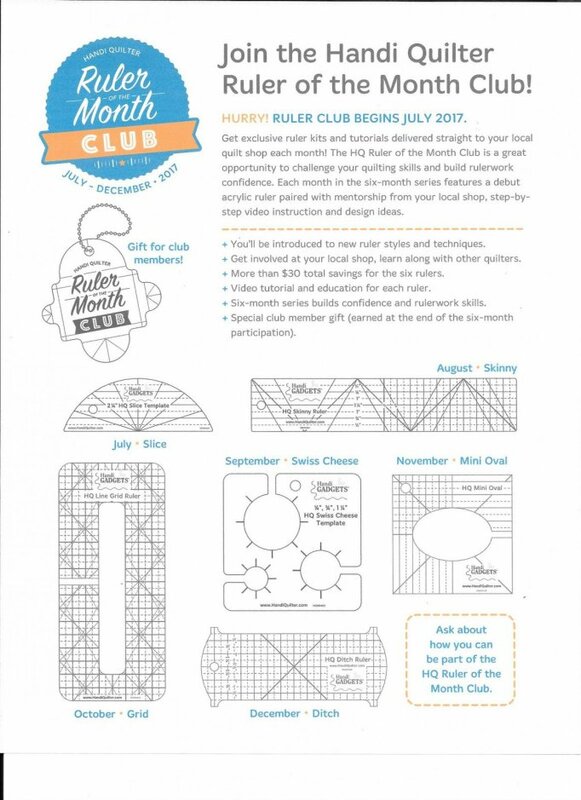 We are starting a 6 MONTH- RULER OF THE MONTH CLUB. BE SURE TO CHECK THIS OUT! It won’t be long before the kids will be back in school. We are already thinking about the Fall Holidays and Christmas! Have to plan ahead. WE ARE STILL HAVING OUR CHRISTMAS IN JULY SALE ON ALL JANOME MACHINES IN STOCK. WE ARE REALLY DEALING ON THESE MACHINES. COME IN AND SEE WHAT WE HAVE. WE HAVE SPECIAL DEALS ON THE SKYLINE S7 TOO. GET THE JUMP ON CHRISTMAS! (This sale DOES NOT include the Janome Longarm Quilt Maker Pro 18). ACCUQUILT CHRISTMAS IN JULY SALE!!! A whopping 30% off on 30 select GO! Dies! The GO! Hexagon 1”, 1 ½” & 2 ½” sides is now $24.49! The GO! Holiday Medley is $31.49and the GO! Flying Geese 3 ½” x 6 ½” are also on sale. These are just a few of what is on the awesome sale! This sale ends July 31st. We just got a new shipment of DIES! Get yours while the quantities last. (The dies that are on 30% off will have a sticker on them. Lots of new Christmas fabric is now on the shelves. We are just in love with all of it. But especially the WINTER CHEER FLANNELS FROM HENRY GLASS! These are so pretty and would make a beautiful quilt, blanket, throw or rag quilt for yourself or a friend for Christmas. Come in and check them out! Lots of panels are now on SALE! New ones coming in all the time just in time for the Holidays! If you have missed a class, we will do a make-up class but we have to have 2 or more students. If you have missed and want to make up the class, please call to schedule. The next Embroidery Class will be August 9th. We will have a sample in the shop after July 18th. Come and see it!